[ctt template=”3″ link=”Cgad5″ via=”yes” ]Approximately 1/6th of world’s population lives in India and about 1/3rd of those are Lacto-vegetarians…that is A LOT OF PEOPLE! [/ctt]Now, figuratively, say half of that population comprises of women and though not all these women are bearing a child at this very moment; still chances are almost all of them already have/ had/will bear a child in the future, right? So the question is, are these women and their unborn children at the risk of protein malnutrition? What do we need protein for? We need protein from diet to make structural proteins for the body (see those muscles…those are proteins!!). We need protein for making enzymes and hormones (think digestion, reproduction, temperature control…think any bodily function really and these two will be involved in it!). We need protein to make antibodies that fight infections. And last but most importantly proteins can also provide energy in emergency situations… In a nutshell, proteins are an irreplaceable part of our diet. 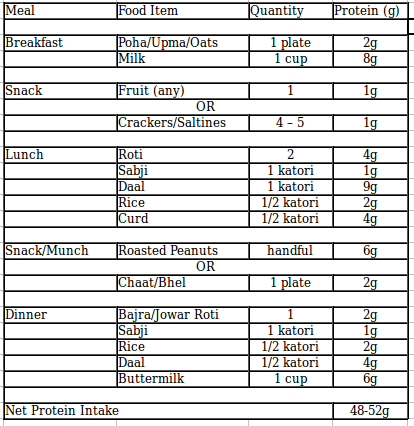 Let’s see…according to the ICMR report protein requirement for healthy Indian adults on a well balanced cereal-legume-milk diet is 0.8–1 g/kg/day. So if you are a 50kg something, healthy and a non-athletic person, your daily protein needs will be ~40–50 gm. What does 40–50gm vegetarian protein looks like? During first and second trimester it is very much possible, but during the third trimester, the needs increase substantially. Thus with a solely lacto-Vegetarian diet, meeting the protein requirements will be difficult unless the milk and milk products intake is substantial! Nuts: “When in rush, my choice of snack is roasted and slightly salted peanuts”. Grab a handful, and you have awarded yourself with 6 grams of crunchy proteinecious deliciousness.. Seeds: Ever eaten roasted pumpkin seeds or roasted sunflower seeds? If not, you are missing out! These nutrient packed seeds are not just great sources of protein (handful=6–8g protein) but also contains good fats (think glowing skin and baby’s brain development..). Eat them roasted or throw them in a salad mix, or in a yogurt parfait. Soy: Soy products are great alternatives for those who are lactose intolerant/has milk allergy or simply dislike milk. Opt for soy milk (try home made, recipe here). Soy chunks, I know some people don’t care for the texture really, but trust me and try this chili soy nuggets recipe and you will never regret it!! Sprouts: Eat them raw, make a sprout bhel, roast them slightly with light sprinkle of salt and turmeric or just make a good old sabji…they are good, nutritious and full of protein in all forms. So my vegetarian mommies to-be, yes you need a little more protein during your special last 3 months of pregnancy…but achieving that is very much doable. Do not fret, just follow your traditional, well balanced meal pattern. Key is to eat balanced meals, include variety of protein sources and just enjoy the food! For any questions and explanations, leave the queries in the reply section down below. You can also get free nutrition consultation with me at DawaiBox.